Download a copy of the Lone Recycler (11.6MB pdf) for an exciting tale of Zero Waste. 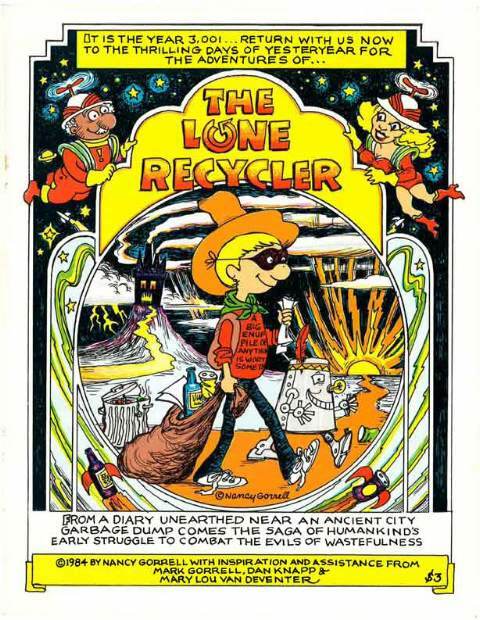 The Lone Recycler is a comic book dating all the way back to 1984. It was created by Nancy Gorrell, a children’s illustrator and longtime friend of Urban Ore. It was written in response to the growing threat of incinerator proposals in the Bay Area. Although the comic book is suitable for children, it also ties into our Policy Planning work. You can download a 11.6MB pdf copy of the Lone Recycler by simply clicking on the image above. It is great for children to read and the message is still very relevant. Includes a coloring page as well. I just downloaded it onto my own computer. You have to click on the image of the Lone Recycler comic. I’m assuming you’ve tried this? I will inquire with the artist as to whether there are hard copies available! Oscar Michel, Urban Ore Office Manager.